An assault rifle used in seven unsolved killings during the Northern Irish Troubles has been found in a public display case in London’s Imperial War Museum. 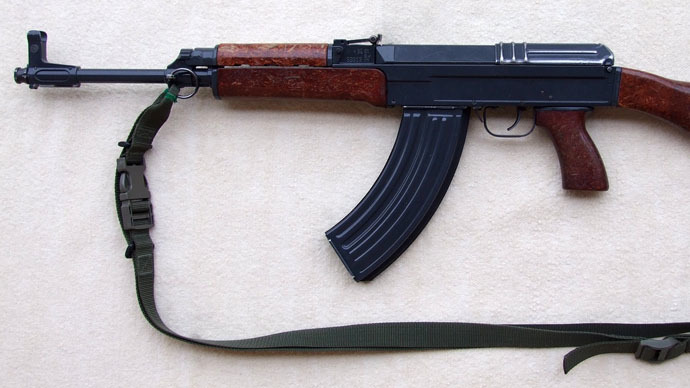 The VZ58 assault rifle, which is of Czech manufacture and outwardly resembles the iconic Kalashnikov, was used in the 1992 killings of five Catholics, including one 15-year-old, at a betting shop in Belfast. It has also been linked with the killing of two men in 1988. Billy McManus, whose father was killed in the betting shop attack, told the Times newspaper: “I am absolutely shocked that a gun connected with so many deaths was there on display for anyone to come and see at the Imperial War Museum in London. According to a Northern Ireland police spokesman, who also said the service welcomes an investigation, the weapon is being returned for appropriate testing. The revelation emerged during a BBC ‘Panorama’ documentary into allegations of collusion between Loyalist paramilitaries and British security forces during the Troubles. In a statement, a spokesperson for the Imperial War Museum said: “IWM believes that we provide an appropriate context for the display of items used in conflict. RT spoke to investigative journalist Iain Overton, who is also Director of Investigations and Policy at the NGO Action on Armed Violence (AOAV) and author of a recent, critically acclaimed book on small arms titled ‘Gun Baby Gun’. Asked if he thought the rifle’s unusual history might reflect more than just a bureaucratic failure, he said its trip from Belfast to London may indeed have been the end result of the “purposeful arming of pro nationalist groups” by the British security services. The existence of the practice, he said, had been well documented in investigative research like that carried out by journalist and campaigner Anne Cadwallader and was proven to have been carried out on a substantial scale. He pointed out that a rifle of the same make was also used in a 1994 County Down pub attack. “This allowed British government lawyers to keep their evidence secret, disclosing it only to a judge behind closed doors, where it cannot be examined or challenged by other lawyers. RT also asked what happens to weapons like the Self-Loading Rifle (SLR) when they become obsolete and replaced by newer weapons – the SA80 assault rifle in the SLR’s case. The disappearance of the rifle echoes the mysterious discovery in 2000 of an SLR by soldiers of 1st Battalion, the Parachute Regiment in Sierra Leone, which was in the same unit’s possession on Bloody Sunday on January 30, 1972. It was reported in ‘Rules of Engagement,’ the memoir of Colonel Tim Collins, formerly of the Royal Irish Regiment and the SAS. The Bloody Sunday incident saw 15 peaceful Northern Irish protestors killed by paratroopers in the Bogside area of Derry. The subsequent Saville Inquiry into the massacre was informed the weapons used had all been destroyed. Yet an SLR matching the serial number of one in Parachute Regiment’s possession on Bloody Sunday was discovered in the hands of the notoriously savage West Side Boys militia in Sierra Leone during the rescue of captured British soldiers by paratroopers and Special Forces.